Mount Kilimanjaro is a dormant stratovolcano in Tanzania. It is the highest mountain in Africa, and rises approximately 4,900 metres (16,100 ft) from its base to 5,895 metres (19,341 ft) above sea level. 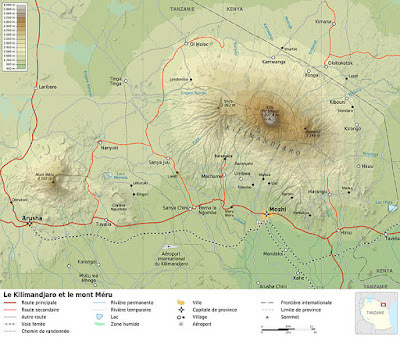 Kilimanjaro's last major eruption was 360,000 years ago. Challenge is the core and mainspring of all human activity. If there's an ocean, we cross it; if there's a disease, we cure it; if there's a wrong, we right it; if there's a record, we break it; and finally, if there's a mountain, we climb it. -- James Ramsey Ullman Challenge is perhaps the primary driver behind our decision to climb Mount Kilimanjaro. It is the tallest mountain in Africa. Its summit resides at an extreme elevation where man is unable to sustain life for any extended duration. Many have climbed Mount Kilimanjaro since its discovery and first ascent in October of 1889. Many have been unsuccessful and some have perished in the attempt. Climbers are challenged physically and mentally by the weather and altitude. The mountain presents a worthy challenge with possible outcomes that include both success and defeat as well as life and death. Kilimanjaro is a compelling challenge and one which has become a source of inspiration and motivation. 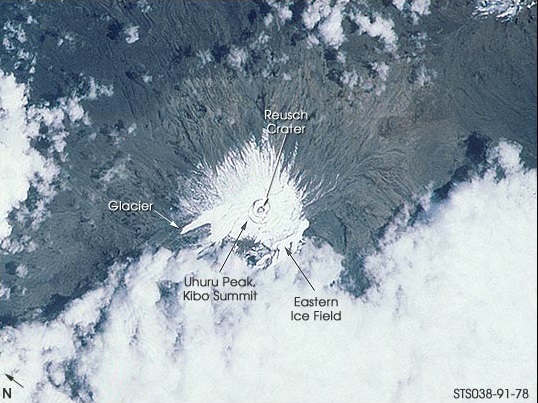 The snows of Kilimanjaro were photographed by the Space Shuttle crew during mission STS-38 (STS038-91-78) in November 1990.